Originally, the artist planned to dress "Freedom" in a Phrygian cap -- a simple, soft, peaked red hat, also called a "liberty cap." A classical motif, the hat had become such a common symbol of political revolution that it eventually ended up on the official seal of the U.S. Senate. However, as the informative website of the Architect of the Capitol notes, after Secretary of War Jefferson Davis objected to the sculptor's intention to include a liberty cap, Crawford replaced it with a crested Roman helmet. Why the objection? Because, in the rising abolition movement, the liberty cap had been adopted as a symbol of freed slaves. Davis, of course, resigned from the Senate in 1861 and accepted appointment as president of the Confederate States of America. In a cruel irony, the complex casting and assembly of the sculpture was overseen by Philip Reid -- a slave at the foundry. 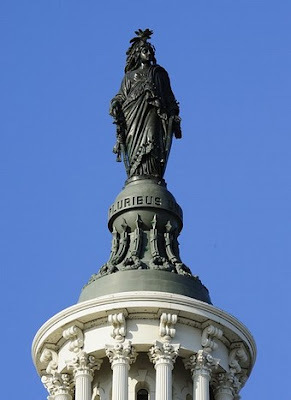 At Obama's swearing-in, the "Statue of Freedom" will gain another level of meaning. Hats off.